The world of Mike Mignola’s Hellboy is full of fantastic characters, from pulp adventurers like Lobster Johnson to the agents of the B.P.R.D., to the big red guy himself, but of them all my personal favorite has always been Sir Edward Grey, Queen Victoria’s personal Witchfinder. I’ve always been a sucker for stories set in Victorian England, and in particular Victorian-era stories with science-fictional or supernatural elements, and so when Mike first mentioned that there had been a Victorian-era occult detective in Hellboy’s world in the pages of Wake the Devil, I was immediately intrigued. 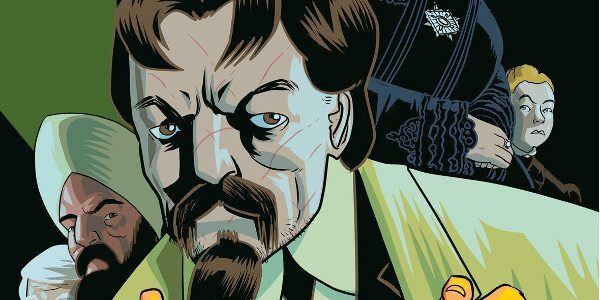 When I read Witchfinder: In The Service of Angels, it felt like Mike and his collaborator Ben Stenbeck had created a comic specifically for me. It had everything that I was obsessed with: occult detectives, secret societies, steampunk technology, ancient mysteries and cursed artifacts, ghosts and monsters and demons and on and on and on. Each new volume of Witchfinder only served to make Sir Edward’s era richer and more compelling, and each time it seemed like the books were being created expressly for my personal enjoyment. When I was first given the opportunity to pitch a story set in Hellboy’s world a few years ago, I jumped at the chance to propose a Witchfinder story, and was lucky enough to work with Mike and Ben Stenbeck on City of The Dead, and to fill it with all of the things I love about Sir Edward and his world.